P. Sabinus was Quaestor in 99 BC. He struck coins in this capicity, but is not otherwise known. 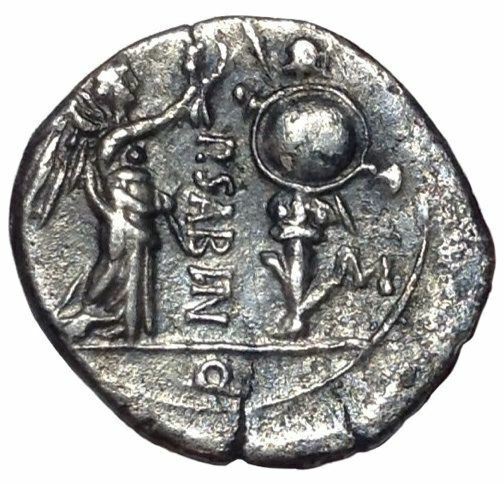 Sabinus is an ancient Roman cognomen originally meaning "Sabine"; that is, it indicated origin among the Sabines, an ancient people of Latium. It was used by a branch of the gens Flavia, of the gens Calvisia, and several others, and is by far the most common of the cognomina indicating ethnic origin that were in use during the Republican and Augustan eras. Sabine heritage carried a positive stereotype of traditional values and trustworthiness, and since the cognomen may have been appropriated by some politicians for its aura of uprightness, it should not always be taken as a mark of authentic Sabine origin. This moneyer is speculated to have belonged to gens Vettia, but this is uncertain.